Growing up in St. Louis, MO, Delphine Chen, MD, got her first exposure to patient care while helping her father in his orthodontic practice during summer breaks from school. This experience also allowed her to see firsthand how X-rays and other imaging were used, and how could they contribute to better treatment. 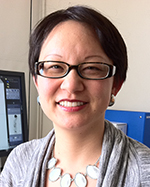 Today, Dr. Chen is using radiographic imaging in innovative ways to make new discoveries about lung disease as the assistant professor of radiology in the Division of Radiological Sciences and Nuclear Medicine at Mallinckrodt Institute of Radiology, and assistant professor of medicine in the Division of Pulmonary and Critical Care, Washington University School of Medicine in St. Louis. Using positron emission tomography (PET) tracers, Dr. Chen and colleagues are learning more about how drugs are affecting pulmonary patients. This work began with her postdoctoral fellowship with Daniel P. Schuster, MD, when they were one of the first groups to develop fluorodeoxyglucose (FDG)-PET to measure lung inflammation. This led to Dr. Chen’s receiving a 2009 Doris Duke Charitable Foundation, through which she began focusing her efforts on researching pulmonary disease, specifically evaluating the efficacy of pioglitazone in reducing endotoxin-mediated inflammation using FDG-PET as a biomarker to determine the level of pulmonary inflammation. This year, Dr. Chen received a grant for the use of PET tracers for imaging the proliferation of T cells in patients with lung transplants, which will allow her to learn which T cells are coming in to cause lung inflammation. She has also received additional grants that will fund projects to investigate which inflammation pathways are being activated. Andrew E. Gelman, PhD, associate professor of surgery, pathology and immunology at Washington University School of Medicine’s Department of Surgery, has worked with Dr. Chen since 2011. Although Dr. Chen considered following a similar path as her father, it was biology that captured her attention. As a student at Harvard University in the early 1990s, she realized that she would find studying the body as a whole and helping people with a broader range of diseases more fulfilling. Dr. Chen graduated with honors from Harvard-Radcliffe College in Applied Math with a focus in chemistry. Next, she returned to St. Louis where she received her medical degree from Washington University School of Medicine. Later, her research with Dr. Schuster led to her interest in continuing to develop molecular imaging techniques for pulmonary disease. Away from all of the laboratory equipment, Dr. Chen enjoys skiing, walking her dog and learning foreign languages. In college, she studied Chinese, and today, she’s learning French with the help of another type of imaging—real-time Skype chats with a teacher in France.